The way pregnant mares are fed affects the rate of sexual maturity in their colts, fresh European research suggests. The researchers from France and Belgium said pregnant mares and weaned foals were often fed concentrates rich in soluble carbohydrates, together with forage. This was done in order to enhance the growth of fetuses and then the foals that would be sold at 1 or 2 years of age. Recent studies, they noted, linked the use of concentrated feeds to alterations of metabolism and the development of the bone growth disorder osteochondrosis in foals. Pascale Chavatte-Palmer and her colleagues set out to determine if the diet of broodmares during their pregnancy affected metabolism, osteoarticular status and the growth of their resulting yearlings, who were overfed at 140% of their required daily rations from 20 to 24 months of age, with the lift coming from concentrated feed. 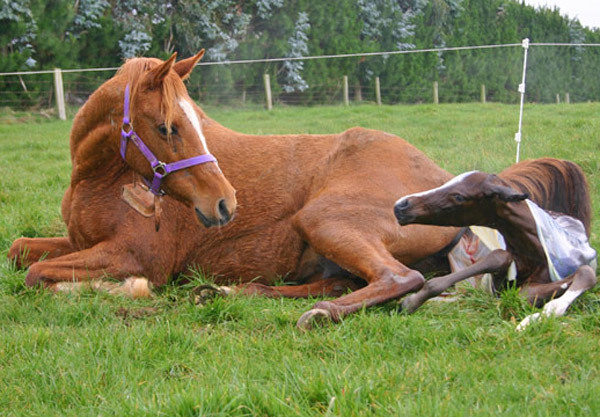 Twenty-four pregnant saddlebred mares were used in the study. Twelve were fed forage only from the seventh month of pregnancy while the other 12 were fed cracked barley and forage from the seven-month mark until foaling. All offspring were monitored for growth between 6 and 24 months of age. Glucose tolerance tests were performed at 19 and 24 months of age, and the osteoarticular status of the youngsters was investigated using X-rays at 24 months of age. The study team, writing in the open-access peer-reviewed journal PLOS ONE, found that weight growth following weaning was not different between groups. However, testicular maturation at the 12-month mark − when they were gelded − was found to be delayed in the colts whose mothers had been fed forage only, compared to those whose mums had received forage and cracked barley. From 19 months of age, the cannon bone was wider in the youngsters from the barley-supplemented mothers compared to the forage-only group. The yearlings in the forage-only group were found to be more insulin resistant at 19 months compared to the barley yearlings, with the barley yearlings subsequently affected more severely by overnutrition through reduced insulin sensitivity. The osteoarticular status at 24 months of age was not different between the groups. “In conclusion,” they reported, “nutritional management of the pregnant broodmare and the growing foal may affect sexual maturity of colts and the metabolism of foals until 24 months of age.” These effects, they said, may ultimately be harmful for reproductive and sporting performances in older horses. Discussing their findings, they said the growth of foals from 6 to 24 months of age was not affected by maternal diet. However, maternal undernutrition seemed to affect bone growth as the foals from mares on the forage-only diet had narrower cannons than those from barley-supplemented mares from 19 months of age. The less mature testicles in the forage-only group indicated that maternal undernutrition affected prepubertal testicular maturation. “The metabolism of foals was also disturbed by maternal undernutrition,” they noted. At 19 months of age, the yearlings from the forage-only mares had decreased insulin sensitivity and increased basal glycaemia compared to the barley group. The feeding challenge in the young horses enhanced acute pancreatic response resulting in a decreased basal glycemia after overnutrition in both groups. However, overfeeding affected the barley yearlings more strongly than the forage yearlings, as decreased insulin sensitivity and enhanced basal insulinemia were observed in the barley group, but not the forage yearlings. The overfeeding challenge reduced insulin sensitivity in the barley group only. The authors suggest that the forage yearlings were less affected than the barley yearlings because they were already insulin resistant before the beginning of the feeding challenge. The 15 researchers involved in the study were variously affiliated with a range of French and Belgian institutions.